The Linksys WRT54GL Wireless Router is really three devices in one box. First, there's the Wireless Access Point, which lets you connect both screaming fast Wireless-G (802.11g at 54Mbps) and Wireless-B (802.11b at 11Mbps) devices to the network. There's also a built-in 4-port full-duplex 10/100 Switch to connect your wired-Ethernet devices together. Connect four PCs directly, or attach more hubs and switches to create as big a network as you need. Finally, the Router function ties it all together and lets your whole network share a high-speed cable or DSL Internet connection. The new push button setup feature makes it easy to configure your wireless devices. Just push the button on this Linksys WRT54GL router and on your other SecureEasySetup-enabled wireless device to automatically create an encryption-secured wireless connection. TKIP and AES protects your data and privacy with up to 128-bit industrial-strength encryption. The Router can serve as a DHCP Server, has a powerful SPI firewall to protect your PCs against intruders and most known Internet attacks, supports VPN pass-through, and can be configured to filter internal users' access to the Internet. Advanced configuration is a snap with the web browser-based interface. Also you can configure Dynamic Domain Name System (DDNS) setting to assign a fixed host and domain name to a dynamic Internet IP address. This is useful for you to host web, email or other server at home by using broadband Internet with dynamic Internet IP address. The Quality of Service (QoS) feature on the router would give you the choices to manual specify the maximum outgoing bandwidth that applications can utilize, or set the priority based on network device, Ethernet port and application. The WMM feature will also provide you the QoS feature if you connect to wireless network. Take a look here if you wish to buy it! This new "L" model has the same Flash and RAM capacities as the older WRT54G models that ran Linux, and thus will support freely and commercially available third-party Linux-based firmware upgrades (voiding the warranty, of course). LinkSys also offers a WRT54GS "speedboaster" model that uses channel bonding with I believe both A and G signals, to realize faster throughput in some use cases. Some older WRT54GS models were available with 8MB of Flash and 32MB of RAM, while current models have 4/16, and thus will also support fancy firmware upgrades, such as those from http://www.dd-wrt.com/, http://www.sveasoft.com/, http://sputnik.com, and so on. These firmwares offer things like optimization for VoWiFi (voice-over-wifi), integration with Radius authentication, bridging, etc, etc, etc. Techie knitty-gritty on all the various permutations, serial number sequences, and so forth can be found at James Depew's unofficial LinkSysInfo.org site. I bought this router because the amazon write up said "compatible with Linux". Since I had just bought a Dell Inspiron 1420 laptop that had Unbuntu 7.04 Linux on it instead of Windows, I figured this router would be just the thing. When the router arrived in the mail however it did not have one single piece of documentation anywhere that had the word Linux in it. A search through the user manual (which comes on the CD as a pdf file buried in a directory that a normal user might not notice) did not yield a single hit on the word "Linux". The installation CD only works on Windows ("setup.exe") and the only instructions that come with it are a piece of tape put over the back of the router that says, "do not use before running the installation CD"). Running the installation CD on a windows computer is frustrating because it asks you to type in the password. The only place where it tells you what the password is, is on a small piece of paper easily overlooked called, "Frequently Asked Questions". That small, easily overlooked piece of paper is also the only place that tells you the address to type into the browser to administer the router. The CD used to configure the router defaults to a connection protocol that few users would use. When you change the protocol to DHCP (which most users would use) it also asks for the host name and the domain name, telling you to contact your ISP to learn their settings if unsure. But for the majority of users the host name and the domain name are not necessary, resulting in a needless call to the ISP technical support line. Trying to setup security using the browser to access the router is frustrating because there are no suggestions or examples provided that would aid a normal user. It has a drop down select list with 5 different security protocols. The user is on her own to guess which protocol to choose and what parameters to type in to configure that protocol. In summary, while this may be a great router physically, the documentation is so confusing and sparse that a normal user will probably end up calling "Geek Squad" or imposing on a more technical friend or relative to actually get the thing working. 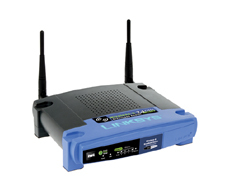 I've bought close to a dozen of the earlier versions of these routers (WRT54G v2-v4) over the past few years as well as recommended them to my friends, and the ability to update and upgrade the flash memory with modified open source software is the reason why these routers deserve a wonderful reputation. The modified software versions, such as HyperWRT and OpenWRT, Sveasoft, etc. have over the years provided capabilities that Linksys themselves didn't put in the box on their own, such as having routers that link up over the wireless connection, or routers that can work well in P2P applications with hundreds of active connections. Some of these features made it back into Linksys's official codebase over the years, helping to make this a Truly Great Product. Linksys has chosen to eviscerate the memory of the latest version (v5) of the WRT54G to make it cheaper. This latest version doesn't have Linux inside and as others have reported isn't nearly as stable as earlier versions, nor is it in any condition to have the open source community help Linksys fix the problems. If you want The Little Blue Box That Could, you now have to buy the WRT54GL. I was using a Belkin "G" router and it was giving me a download speed of 500 kbps...with an ethernet cable even. I stumbled upon some articles about this router and bought it hoping for the best. I now get a speed in excess of 5000 kbps! Wired or wireless! This router is excellent...HIGHLY recommended! And all this time I've been blaming ComCast! My bad. Return to top of "Linksys WRT54GL Wireless Router"! !